This is a really hard book to talk about, because it really doesn’t fit anywhere. It’s completely different than anything else I’ve read, and people will either love or hate this book based on those differences. I don’t really see there being much middle ground with this book. First things first, I don’t know how Catherynne M. Valente can possibly contain as much talent as she does. I mean, really. Isn’t there a threshold where you get so talented you explode or something? For your own safety, you cannot reach a certain level of awesome or you become radioactive? Apparently not, because if that was the case, Valente would have surpassed that limit a long, long time ago. Long time ago. I honestly think this woman could write a grocery list and I’d probably preorder the damn thing. The thing is, she writes with subtle humor, but also stark human truths couched in these gorgeous, glorious phrases that I just kind of want to wallow in. This book is full of stuff that is dark, human, funny, and shockingly true. It’s like she manages to shine a light on the human condition and fill her book with it. And I love it. I can’t get enough of it. This woman is amazing. Real life is all beginnings. Days, weeks, children, journeys, marriages, inventions. Even a murder is the beginning of a criminal. Perhaps even a spree. Everything is prologue. Every story has a stutter. It just keeps starting and starting until you decide to shut the camera off. Half the time you don’t even realise that what you’re choosing for breakfast is the beginning of a story that won’t pan out till you’re sixty and staring at the pastry that made you a widower. No, love, in real life you can get all the way to death and never have finished one single story. Or never even get one so much as half-begun. As I said above, this book refuses to be defined or pushed into any one category. It’s too broad for a label to stick to, and that’s fine. It’s part noir, part science fiction space opera, and a lot of discopunk (what does that even mean, really?). This is a story that spans the solar system and is told in numerous different ways, through interviews, articles, stories, different perspectives, and all sorts of different artistic mediums. It’s quite well done, and very, very unique. In fact, I don’t think I’ve ever read a book that tells a story in this way before. Of course it’s a gamble, and like most gambles, it will either pay off or it won’t. The problems that some people might find are a few fold. First, this story isn’t really cohesive in many respects. The narrative skips around quite a bit, and while it is absolutely riveting, some readers might wish that it went a little deeper into a few more focused individual’s stories. Secondly, the world is sprawling. The solar system has been populated, and it’s so richly realized, but I felt like Valente really only skimmed the surface. While that didn’t really bother me, I can see where some readers might be taken back by it, and wish that Valente had chosen one location to really focus on and bring to life. The world is fascinating, and I do kind of wish there had been more depth to it. The ending is left open, and unfinished, which I think is the point but it will absolutely frustrate some readers. However, I don’t think that was a mistake on Valente’s part. The real issue, in my mind, is the lack of a cohesive narrative. While I can see the logic in that, and the fact that some points were purposely left unexplained and unfinished, it created a sort of confused jumble at points. Occasionally things just didn’t click together, the pieces didn’t slide in place. The writing was beautiful, but the story felt, honestly, kind of messy. The truth remains, Radiance so unique, so flawless and well realized, the frustration I occasionally felt really surprised me. On the flip side of that, once I had this novel figured out and saw how the story was being told and what direction things were moving, I realized how purely genius Valente was for writing a book in this way. Yeah, it can be confusing, and I can easily see how it will put some readers off, but she’s telling a deep, captivating, sprawling story in a way that, even at the confusing points, is nothing short of addicting. There’s an art to how Valente told this story, and like most art, it will either hit or miss you depending on how you perceive it. One thing I can say, however, is that this is, hands down, one of the most unique books I’ve read this year. Bar none. 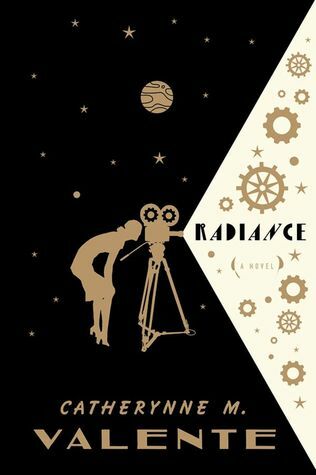 Valente is an incredibly talented author, and Radiance really shows what she is capable of. This author, like the book she wrote, refuses to be defined, and that’s what makes both her and her book(s) so damn glorious.